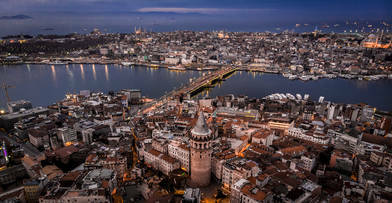 The Golden Horn is one of the most prominent geographical features of Istanbul, Turkey. Named for its horn-like shape, it's an inlet of the Straits of Bosphorus on the western (European) side of the waterway. In this drone video by contributor gokhanakman, you'll get an aerial tour of this famous inlet, including shots of the Atatürk Bridge and Galata Bridges which span it. The latter is more well known; the current version was opened in 1994 on the site of four earlier versions. Description: The Golden Horn also known by its modern Turkish name, Haliç is a major urban waterway and the primary inlet of the Bosphorus in Istanbul, Turkey.